This article is a short summary of Super Mario Party. 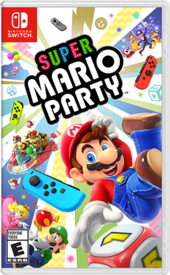 Super Mario Party is a game in the Mario Party series, released for Nintendo Switch. The style of gameplay is more similar to earlier entries in the Mario Party series, and the game is described by Nintendo as "a complete refresh of the Mario Party series". Up to four players play as Mario characters and advance around the board using a Dice Block which controls how much the player can move each turn. At the end of every turn is a multiplayer minigame. This page was last edited on 4 November 2018, at 16:08.